They say the people could fly. Say that long ago in Africa, some of the people knew magic. And they could walk up on the air like climbin’ on a gate. And they fly like blackbirds over the fields. Black, shiny wings flappin’ against the blue up there. As told on The Sophisticate Life: Using different fibers, textured fabrics and swatches of cloth, African-American artist Bisa Butler captures an expression, or tells a story with just one piece of quilted art. Bisa was raised in South Orange, NJ, the youngest of three children born to a French teacher and a college president. She graduated from Howard University with a bachelor’s degree in Fine Arts, concentrating in painting. She went on to earn a master’s degree in Art Education from Montclair State University in 2004. Quilting became her genre when she constructed a quilt for her ailing grandmother. 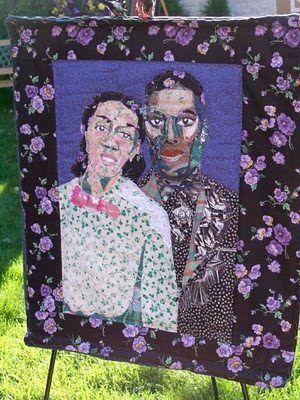 Her first quilt was based on a small photo booth picture of her grandparents, Francis and Violette Hammond. Bisa says her grandmother had given so much to her family, “this was one thing I could give her that was special.” After that, she was bitten by the quilting bug and became inspired to do more. Bisa is known for adding different types of fabrics to her art pieces—something she was moved to do from the collages of artist Romare Bearden. The motivation behind these extraordinaire pieces of art comes from African American society. Bisa says she’s most inspired just from looking at old black and white photo albums, “I think they are very interesting”. Her enthusiasm and stimulation from old photos has erupted into nationwide recognition for her gift, as exemplified through esteemed art exhibitions. Her most prestigious exhibition was at the Smithsonian Institute in our nation’s capital of Washington, D.C. As thrilled as she was by the invitation from the Smithsonian, she still gets butterflies with each new exhibition. She has shown her work from the Studio Museum in Harlem, to the California African American Museum in Los Angeles—just to name a few places. On Saturday, February 13, please join Richard Beavers, owner and head curator of the Richard Beavers Gallery (formerly known as the House of Art Gallery) for the opening reception of “The People Could Fly: Royalty Without the Riches,” an exhibition of the Quilts of Bisa Butler.